One of Trevecca’s most popular social events will not be canceled this year—it will just be different. Glow with the Flow, a night that included techno music, glow sticks and inflatable bounce games in the past, is still on the calendar. But this year students can expect the inflatables to be gone and new activities still in the works to take their place. 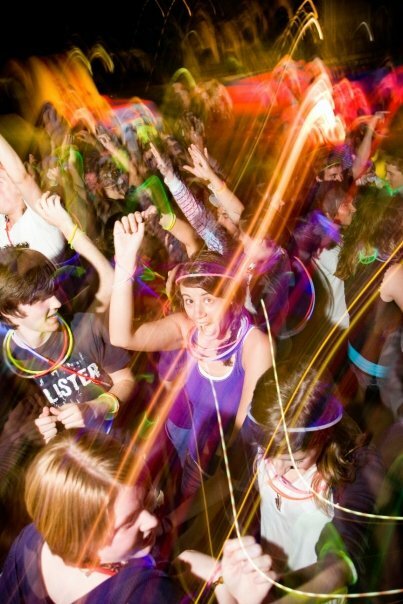 Rest assured the spring night designed to help students celebrate the end of the school year will be glowing. A few students and some members of the Student Government Association complained last year that the event too closely resembled dancing, which violates the university’s entertainment policy. To save the event and make sure it’s in line with the student handbook and the manual of the Church of the Nazarene this year Glow with the Flow will look different from the usual glowing mob of jumping students. SGA and the Social Life Director, Emily Rowden, are not sure what the changes will be but their goal is to find a way to keep the popular event at night, glowing, and laced with music. More activities, still undecided, will be part of Glow with the Flow to hinder the temptation of dancing, Rowden said. “We are going to take it in a totally new direction,” she said. The types of changes are not finalized, but one idea is a black out with glow in the dark paint ball. The inflatable games may not be returning. Rowden said they were not used very much in past years and it is not worth the expense. The discussion among students about last year’s event led to rumors that the event would be canceled this year. Matt Spraker, Associate Dean for Students of Community Life, explained that although the event was never to be a social dance there was a question of the atmosphere and whether or not students were dancing. Members of SGA and other students expressed some discomfort with event because of the possibility of dancing. Spraker spoke to several young men struggling with sexual temptation who found the event difficult to go to because of the dance-like behavior of some fellow students. Glow with the Flow first made its début at Trevecca in the 2007-2008 school year. Point Loma Nazarene University in San Diego, CA hosted a similar event on its campus. The event there had games and inflatables. Trevecca SGA members heard of the idea at Nazarene Student Leadership Conference and brought the event back home to Trevecca’s quad in Nashville. The event has become one of the most popular on campus. Rowden said there were no formal complaints filed the first year and about six the following year. But some members of SGA still felt Glow with the Flow caused too much confusion and discomfort. This stemmed the rumor of a cancelation. It was never an administrative decision to take the event off of the calendar, she said. Jared Usrey, Associated Student Body President, declined to be interviewed for this story. When Hayley Knowles, a junior at Trevecca who has attended the event for the past two years, heard of the possibility that Glow with the Flow was canceled, she was not thrilled with the idea. But she did understand why it might be canceled because of the school’s association with the Church of the Nazarene and the appearance of it being a social dancing event. “It’s one of those things that you don’t miss. Also, glow sticks are fun,” Knowles said. She said it would be good if there were a better way to contain the event and monitor the activities. She said she and her friends don’t inappropriately “dance” and just jump around and have fun, but she acknowledged there are some students that might be. Dan Boone, university president, and his wife Denise attend the event each year. They too put on the glow in the dark necklaces and bracelets and unwind to the techno. “I was not at all offended by anything I saw at Glow with the Flow. Denise and I had a blast there,” Boone said. Click here to see the Church of the Nazarene Manual for details on the social dancing. I had no idea that there was this kind of controversy about Glow with the Flow! This is a very informative and well-researched story. I enjoyed reading it.